This 10 inch Miter Saw offers a unique override mechanism which allows fine tuned adjustments to the pre-set miter angle for precision cutting. Pre-set positive stops are set at 0 degrees, 15 degrees, 22.5 degrees, 30 degrees and 45 degrees both left and right. Bevel angles from 48 degrees left to 3 degrees right with the non-slip locking system. Miter angles from 51 degrees left to 59 degrees right. Miter table rotates on roller bearings for smooth positive miter settings. An extra tall flip fence offers maximum material support throughout the cut. Vertical Capacity (Crown molding nested vertically): 5-1/2 in. 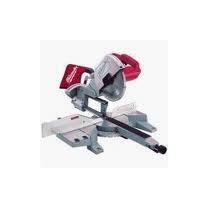 * Questions on our miter saw 10 inch sliding kobalt rentals? Please call us!